Adisutjipto (or Adisucipto) International Airport (Indonesian: Bandar Udara Internasional Adisutjipto) (IATA: JOG, ICAO: WAHH) is the principal airport serving the Yogyakarta area on the island of Java, Indonesia. It is in the Sleman Regency, in the Yogyakarta Special Region, on the northeast outskirts of the city, near the Prambanan historic temple site. It has one runway, with dimensions of 2,200 metres (7,200 ft) by 45 metres (148 ft). The airport is about 6 kilometres (3.7 mi) from the city center. Adisutjipto Airport is the 4th busiest airport in the region of Java–Bali, after Soekarno–Hatta International Airport (CGK) in Jakarta, Juanda International Airport (SUB) in Surabaya and Ngurah Rai International Airport (DPS) in Bali. The number of passengers flying through Adisucipto International Airport in Yogyakarta, throughout 2016 increased by approximately 13 percent compared to 2015. 7.2 million passengers were recorded in 2016 whereas in 2015, the number was 6.38 million. Adisutjipto Airport was preceded by a landing ground at Maguwo which was used before and during the Second World War. It is named after Agustinus Adisucipto, a pilot who was killed during an attack on Maguwo by the Dutch on 29 July 1947, when his flight, the Dakota VT-CLA, was shot down. The airport was heavily damaged by the 2006 Yogyakarta earthquake and had to be closed for two days. Some parts of the runway were cracked, and the departure lounge collapsed. Most flights were cancelled or rerouted to Adisumarmo International Airport, Solo. After the airport returned to service on 30 May 2006, all passengers used the international lounge until the new domestic departure lounge was ready. During this period, passenger comfort was affected as the international lounge was designed only for about 100 passengers at a time. The airport was closed for several days due to the 2010 Mount Merapi eruption as the volcanic ash could endanger the safety of flights. During this period, passengers were diverted to Adisumarmo International Airport in Solo, Achmad Yani International Airport in Semarang, or transferred to another mode of transportation to the city of Yogyakarta. 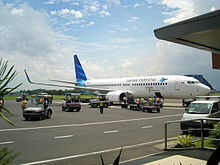 Before Adisutjipto became an international airport, Yogyakarta relied on Bali and Jakarta for its international flights. It became an international airport on 21 February 2004 with the first flight, to Kuala Lumpur, Malaysia, operated by the Indonesian flag carrier Garuda Indonesia. This was the successful conclusion to the city's efforts of over 30 years to have its own international airport. One month later, Garuda Indonesia operated its second international flight, to Singapore. Due to low demand, Garuda Indonesia ceased international flights from the airport on November 2006. International flights resumed on 30 January 2008 when AirAsia began to fly the Yogyakarta–Kuala Lumpur route using Airbus A320 aircraft. From 1 February 2008, Malaysia Airlines started to serve the Yogyakarta–Kuala Lumpur route operating Boeing 737-400 aircraft but ceased operation in 2011. In April 2008 AirAsia raised the frequency of its Yogyakarta–Kuala Lumpur flights from four times weekly to daily. In December 2008, Garuda Indonesia resumed its Yogyakarta–Singapore flight, operating three times weekly but ceased in 2009. AirAsia started to fly a Yogyakarta–Singapore flight on 24 March 2009, operating daily. SilkAir, a subsidiary of Singapore Airlines, began operating Yogyakarta-Singapore route from 25 October 2013 and now operates daily services using Boeing 737-800 and Airbus A320-200 aircraft between the two cities. Adisucipto is being redeveloped to cope with the increasing number of passengers. The location of this airport is unusual since the terminal is only about 10 metres from a railway line. A long-range plan has been developed to build Adisucipto as a "fused terminal" by building a railway station and bus terminal in the airport. There is still a problem of limited availability of land. An underpass connecting the terminal building and a new carpark (to the north of the railway) has been completed. The construction of the new Maguwo Station to the north of the airport has also been completed. In August 2015, a new Terminal B was open for operation. The new terminal handles all international traffic and the domestic service of some low-cost carriers. There are plans to lengthen the runway by 300 metres (980 ft) to the east. The runway will then be 2,500 metres (8,200 ft) in length. Plans also call to widen the apron so that it will be able to handle 11 Boeing 737-400s and 2 Boeing 767-300ERs, and expansion of the terminal. Currently the airport has a secondary taxiway beside having a primary taxiway to the south of the apron. It's to the east of the apron. This taxiway is used to link runway 27 with the apron. The limited availability of land around the airport and overcapacity caused the government to plan to relocate the airport to Temon in Kulon Progo Regency. PT Angkasa Pura I and Yogyakarta provincial government has decided to build the new airport in Kulonprogo (include the airport city). It will be built without central government funding and will be built by joint venture between PT Angkasa Pura I and GVK Group from India with 51 and 49 percent shares, respectively. The new airport can accommodate up to 30 million passengers per year and expected to boost the tourism economy, trade and industry Yogyakarta. It will be completed in 2019 and fully operated beginning in 2020. Adisucipto International Airport is one of the busiest in the Java–Bali region. It has faced a growing trend in passengers over the past decade. The table below is based on data from PT Angkasa Pura I, who is responsible for management of the airport. Shuttle buses serve several destinations from Adisucipto Airport; it is served by a bus operator Damri. These fares are valid as of July 20, 2016. Trans Jogja, a bus rapid transit (BRT) of Yogyakarta opened several routes passing through the Adisucipto Airport which connects passengers to destinations around Yogyakarta, along with other Trans Jogja routes. Located in Solo Road km. 9 which connects Adisucipto Airport to Yogyakarta city center and also Solo. There is extensive car and motorcycle parking space available. Car rental and taxis are available. Adisucipto Airport is connected with Maguwo Station. Maguwo Station is equipped with underground tunnel which connects passengers to the airport. This station is served by Prambanan Express (economy commuter) and Solo Express (executive commuter), both serving Kutoarjo-Yogyakarta-Solo Balapan corridor. On 13 January 1985, a Vickers Viscount PK-RVT of Mandala Airlines was damaged beyond economic repair after it made a belly landing. On 13 January 1995, Garuda Indonesia's Boeing 737-300 PK-GWF overran the runway by about 50 meters due to the runway being wet with rain. There were no casualties. On 7 March 2007, Garuda Indonesia Flight 200, a Boeing 737-400 PK-GZC, came in too fast, bounced twice, overran the runway and burst into flames upon landing from Jakarta. 21 passengers and a crew member were killed in this accident. This was the first fatal incident at Adisucipto Airport/AFB. On 20 December 2011, Sriwijaya Air Flight 230, operated by Boeing 737-300 PK-CKM, overran the runway as it was not on a stabilized landing criteria and came in too fast. There were no casualties. On 6 November 2015, Batik Air flight 6380, a Boeing 737-9GP(ER) PK-LBO, overran the runway on landing by 100 meters which caused the nose gear to collapse. No casualties were reported. On 1 February 2017, Garuda Indonesia Flight 258, a Boeing 737-800 registered PK-GNK overran the runway. All 123 passengers on board survived. Beside those accidents, there are some other minor incidents mainly because of landing in rain but without any casualties. ^ "Yogyakarta to get new airport". 26 February 2012. Archived from the original on 16 June 2012. ^ "Kulonprogo menjadi lokasi bandara internasional". 4 June 2012. Wikimedia Commons has media related to Adisutjipto International Airport. Airport information for WARJ at World Aero Data. Data current as of October 2006.